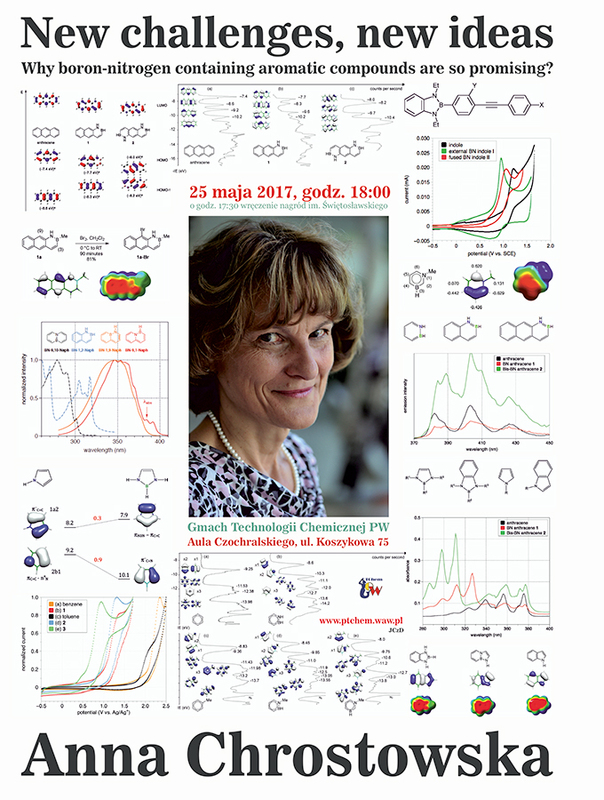 Anna Chrostowska – Why boron-nitrogen containing aromatic compounds are so promising? New challenges, new ideas. l’Université, 64 000 Pau, France. Boron(B)-nitrogen(N)-containing heteroaromatic compounds are a family of heterocycles that are isoelectronic and isostructural to the family of classical organic counterparts, as for example benzene, naphthalene and anthracene, and also as mono-nitrogen containing heterocycles such as pyrrole, indole and iso-indole. The first compounds synthesized in the 1950s, resurged interest in the mid 2000s, due to the particularly interesting electronic properties and potential applications, for example as organic-based optoelectronic devices or biomedical agents. To improve our understanding of the electronic structure of the BN-aromatics, we have studied BN-monocyclic1–3 (five- and six-membered heterocycles), BN-bicyclic4–6 and BN-tricyclic7 analogs, using a combined UV-photoelectron spectroscopy (UV-PES) / computational chemistry approach. Ultraviolet photoelectron spectroscopy (UV-PES) is a well-established technique to provide ionization energies of molecules in gas phase. These experimental data supported by quantum calculations for the consistency of the assignments of PE bands provide fundamental information about electronic structure and bonding that is obtained by no other technique. Thus, considering that the electronic structure depends strongly of the orientation of the BN pattern placement, the exploration of the BN substitution strategy in such systems is of great importance for effective tuning of the chemical and physical properties of conjugated molecules with one or more BN unit embedded. 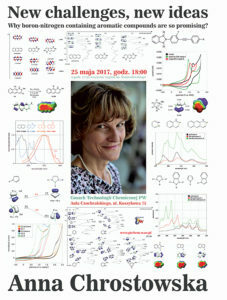 (1) Weber, L.; Domke, I.; Greschner, W.; Miqueu, K.; Chrostowska, A.; Baylere, P. Organometallics 2005, 24 (22), 5455–5463. (2) Chrostowska, A.; Xu, S.; Lamm, A. N.; Maziere, A.; Weber, C. D.; Dargelos, A.; Baylere, P.; Graciaa, A.; Liu, S.-Y. J. Am. Chem. Soc. 2012, 134 (24), 10279–10285. (3) Chrostowska, A.; Dargelos, A.; Baylere, P.; Darrigan, C.; Weber, L.; Halama, J. Eur. J. Inorg. Chem. 2015, 2015 (31), 5196–5201. (4) Chrostowska, A.; Maziere, A.; Dargelos, A.; Graciaa, A.; Darrigan, C.; Weber, L.; Halama, J. Eur. J. Inorg. Chem. 2013, 2013 (33), 5672–5678. (5) Chrostowska, A.; Xu, S.; Maziere, A.; Boknevitz, K.; Li, B.; Abbey, E. R.; Dargelos, A.; Graciaa, A.; Liu, S.-Y. J. Am. Chem. Soc. 2014, 136 (33), 11813–11820. (6) Liu, Z.; Ishibashi, J. S. A.; Darrigan, C.; Dargelos, A.; Chrostowska, A.; Li, B.; Vasiliu, M.; Dixon, D. A.; Liu, S.-Y. J. Am. Chem. Soc. 2017. (7) Ishibashi, J. S. A.; Marshall, J. L.; Maziere, A.; Lovinger, G. J.; Li, B.; Zakharov, L. N.; Dargelos, A.; Graciaa, A.; Chrostowska, A.; Liu, S.-Y. J. Am. Chem. Soc. 2014, 136 (43), 15414–15421.